We are now in the season of Lent. It has been a tradition for our community to begin Lent on Ash Wednesday by joining Pax Christi and many other Christians for a peace liturgy outside the Ministry of Defence. We did so also this year. First we recognise our own sinfulness before we witness against and resist nuclear war preparations by marking the building of the Ministry of Defence with blessed charcoal. 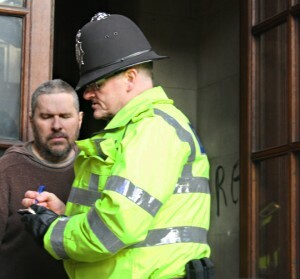 This year Scott managed to write “Repent” on the wall inside the door to the Old War Office before being stopped by the police and handcuffed. He was arrested and taken to the Charing Cross Police Station. About three hours later he was released and has to appear again at the Station on the 14th of May to find out if he will be charged with Criminal Damage and/or SOCPA section 128 for entering a military establishment. He has been banned from the City of Westminster until he appears again at Charing Cross Police Station.